Anyone in the know will tell you: When it comes to espousing a profoundly vibrant independent music scene, New Jersey has got it going on. Not only has it been the birthplace of countless world-renowned artists, but the underground scene is always moving, ebbing and flowing in clubs, bars and basements. And in these small, cramped, sweaty Garden State basements, you will find the very root of all the state’s musical prowess: young inspired artists delivering their truths in the most pure and primitive form. The Gray Vines are wearing the NJ DIY aesthetic on their sleeves in their ferocious new single, “See Me”. The Gray Vines are the brainchild of singer/guitarist, Jake Hoffman. With new bassist/keyboardist Casey O’Connell and drummer/vocalist Jordan Bowen among TGV ranks, the band is officially strapped in for their rock and roll journey. 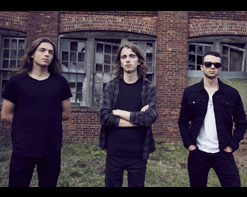 Their debut self-titled EP was released less than a year ago and they’re already releasing songs off their forthcoming followup EP, Obscene set for release February 9th. It’s that kind of relentless work ethic that sets the band apart from their peers. Departing considerably from the alt-rock sound of their debut, Obscene takes on a defiantly powerful and blisteringly fast punk-leaning sound, a toe curling, sonic frenzy of bottled-up energy that you can hear erupting out of the souls of the trio on “See Me”. The music video for “See Me” showcases The Gray Vines jamming their hearts out in a dreamy basement setting with the intensity of the song putting viewers on edge. Adding to the weight of the video, videographer and editor, Matt Cerisano used footage of real riots and freedom fighters from around the world. Hoffman states that the song is about the wage gap creating inequality, but many of his lyrics also invoke dual meanings, allowing the song to apply to inequality of all kinds; a true protest song. The amorphous guitar playing and frenetic drumming creates a beautifully destructive environment for Hoffman’s throat-bleeding screams to pierce through the mix, solifidying “See Me” as a haunting cry in an unforgettable song. The Gray Vines have that innate ability to electrify audiences with their music, and we can’t wait for the world to see his wonderfully crafted two minute blast of rock and roll adrenaline. Please don’t be shy about getting in touch to let us know what we can do on our end to get the “See Me” video included into your programming and rest assured we’ll have plenty of outstanding The Gray Vines merch to set up online/on-air contests and giveaways throughout the campaign. Please contact Andy Gesner and the HIP Video Promo team at (732)-613-1779, email us at info@HIPVideoPromo.com. You can also visit www.TheGrayVines.com for more info on The Gray Vines.